The editorial and publication processes of the journal are shaped in accordance with the guidelines of the Committee on Publication Ethics (COPE), the European Association of Science Editors (EASE), the International Council of Medical Journal Editors (ICMJE), and National Information Standards Organization (NISO). The journal conforms to the Principles of Transparency and Best Practice in Scholarly Publishing (https://doaj.org/bestpractice). Manuscripts submitted to “Aquatic Research” will go through a double-blind peer-review process. Each submission will be reviewed by at least two external, independent peer reviewers who are experts in their fields in order to ensure an unbiased evaluation process. The editorial board will invite an external and independent editor to manage the evaluation processes of manuscripts submitted by editors or by the editorial board members of the journal. The Editor in Chief is the final authority in the decision-making process for all submissions. An approval of research protocols by the Ethics Committee in accordance with international agreements (World Medical Association Declaration of Helsinki “Ethical Principles for Medical Research Involving Human Subjects,” amended in October 2013, www.wma.net) is required for experimental, clinical, and drug studies. If required, ethics committee reports or an equivalent official document will be requested from the authors. For manuscripts concerning experimental research on humans, a statement should be included that shows the written informed consent of patients and volunteers was obtained following a detailed explanation of the procedures that they may undergo. Information on patient consent, the name of the ethics committee, and the ethics committee approval number should also be stated in the Materials and Methods section of the manuscript. It is the authors’ responsibility to carefully protect the patients’ anonymity. For photographs that may reveal the identity of the patients, signed releases of the patient or of their legal representative should be enclosed. “Aquatic Research” journal requires experimental research studies on vertebrates or any regulated invertebrates to comply with relevant institutional, national and/or international guidelines. The journal supports the principles of Basel Declaration (https://www.basel-declaration.org/) and the guidelines published by International Council for Laboratory Animal Science (ICLAS) (http://iclas.org/). Authors are advised to clearly state their compliance with relevant guidelines. “Aquatic Research” journal advises authors to comply with IUCN Policy Statement on Research Involving Species at Risk of Extinction and the Convention on the Trade in Endangered Species of Wild Fauna and Flora for research involving plants. In the event of alleged or suspected research misconduct, e.g., plagiarism, citation manipulation, and data falsification/ fabrication, the Editorial Board will follow and act in accordance with COPE guidelines. 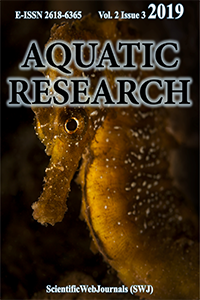 “Aquatic Research” journal requires corresponding authors to submit a signed and scanned version of the authorship contribution form (available for download through http://scientificwebjournals.com/AquatRes/AquatResCopyrightandAuthorContributionForm2019.pdf) during the initial submission process in order to act appropriately on authorship rights and to prevent ghost or honorary authorship. If the editorial board suspects a case of “gift authorship,” the submission will be rejected without further review. As part of the submission of the manuscript, the corresponding author should also send a short statement declaring that he/she accepts to undertake all the responsibility for authorship during the submission and review stages of the manuscript. “Aquatic Research” journal requires and encourages the authors and the individuals involved in the evaluation process of submitted manuscripts to disclose any existing or potential conflicts of interests, including financial, consultant, and institutional, that might lead to potential bias or a conflict of interest. Any financial grants or other support received for a submitted study from individuals or institutions should be disclosed to the Editorial Board. To disclose a potential conflict of interest, the ICMJE Potential Conflict of Interest Disclosure Form should be filled in and submitted by all contributing authors. Cases of a potential conflict of interest of the editors, authors, or reviewers are resolved by the journal’s Editorial Board within the scope of COPE and ICMJE guidelines. When submitting a manuscript to “Aquatic Research” journal, authors accept to assign the copyright of their manuscript to ScientificWebJournals. If rejected for publication, the copyright of the manuscript will be assigned back to the authors. “Aquatic Research” journal requires each submission to be accompanied by a Copyright Transfer Form (available for download at http://scientificwebjournals.com/AquatRes/AquatResCopyrightandAuthorContributionForm2019.pdf). When using previously published content, including figures, tables, or any other material in both print and electronic formats, authors must obtain permission from the copyright holder. Legal, financial and criminal liabilities in this regard belong to the author(s). Statements or opinions expressed in the manuscripts published in “Aquatic Research” journal reflect the views of the author(s) and not the opinions of the editors, the editorial board, or the publisher; the editors, the editorial board, and the publisher disclaim any responsibility or liability for such materials. The final responsibility in regard to the published content rests with the authors. The manuscripts should be prepared in accordance with ICMJE-Recommendations for the Conduct, Reporting, Editing, and Publication of Scholarly Work in Medical Journals (updated in December 2017 - http://www.icmje.org/icmje- recommendations.pdf). Authors are required to prepare manuscripts in accordance with the CONSORT guidelines for randomized research studies, STROBE guidelines for observational studies, STARD guidelines for studies on diagnostic accuracy, PRISMA guidelines for systematic reviews and meta-analysis, ARRIVE guidelines for experimental animal studies, TREND guidelines for non-randomized studies, and COREQ guidelines for qualitative studies. Authors are required to submit the following forms during the initial submission. · ICMJE Potential Conflict of Interest Disclosure Form (should be filled in by all contributing authors) Download this form from http://www.icmje.org/conflicts-of-interest/ fill and save. Send this to the journal with your other files. Conflict of interests: When you (or your employer or sponsor) have a financial, commercial, legal or professional relationship with other organizations or people working with them, a conflict of interest may arise that may affect your research. A full description is required when you submit your article to a journal. Ethics committee approval: Ethical committee approval is routinely requested from every research article based on experiments on living organisms and humans. Sometimes, studies from different countries may not have the approval of the ethics committee, and the authors may argue that they do not need the approval of their work. In such situations, we consult COPE’s “Guidance for Editors: Research, Audit and Service Evaluations” document and evaluate the study at the editorial board and decide whether or not it needs approval. Financial disclosure: If there is any, the institutions that support the research and the agreements with them should be given here. Acknowledgment: Acknowledgments allow you to thank people and institutions who assist in conducting the research. Original Articles: This is the most important type of article since it provides new information based on original research. The main text should contain Introduction, “Materials and Methods”, “Result and Discussion” and Conclusion sections. Statistical analysis to support conclusions is usually necessary. Statistical analyses must be conducted in accordance with international statistical reporting standards. Information on statistical analyses should be provided with a separate subheading under the Materials and Methods section and the statistical software that was used during the process must be specified. Review Articles: Reviews prepared by authors who have extensive knowledge on a particular field and whose scientific background has been translated into a high volume of publications with a high citation potential are welcomed. These authors may even be invited by the journal. Reviews should describe, discuss, and evaluate the current level of knowledge of a topic in researches and should guide future studies. The main text should start with Introduction and end with Conclusion sections. Authors may choose to use any subheading in between those sections. Short Communication: This type of manuscript discusses important parts, overlooked aspects, or lacking parts of a previously published article. Articles on subjects within the scope of the journal that might attract the readers’ attention, particularly educative cases, may also be submitted in the form of a “Short Communication” Readers can also present their comments on the published manuscripts in the form of a “Short Communication”. The main text should contain Introduction, “Materials and Methods”, “Result and Discussion” and Conclusion sections. Figures, graphics, and photographs should be submitted as separate files (in TIFF or JPEG format) through the submission system. The files should not be embedded in a Word document or the main document. When there are figure subunits, the subunits should not be merged to form a single image. Each subunit should be submitted separately through the submission system. Images should not be labelled (a, b, c, etc.) to indicate figure subunits. Thick and thin arrows, arrowheads, stars, asterisks, and similar marks can be used on the images to support figure legends. Like the rest of the submission, the figures too should be blind. Any information within the images that may indicate an individual or institution should be blinded. The minimum resolution of each submitted figure should be 300 DPI. To prevent delays in the evaluation process, all submitted figures should be clear in resolution and large (minimum dimensions: 100 × 100 mm). Figure legends should be listed at the end of the main document. Major Citations for a Reference List in Table 2. Carter, S. & Dunbar-Odom, D. (2009). The converging literacies center: An integrated model for writing programs. Kairos: A Journal of Rhetoric, Technology, and Pedagogy, 14(1), 38-48.